Review Body: Made this for a work event. Personally, I thought the amount of bourbon was a little too much- it sort of masked the taste of the pumpkin. But if you like kind of boozy tasting desserts, this is totally your recipe. But next time I make this, I plan on adding 3 tbsp bourbon instead of 4 (I like it boozy, just not WHAMMO boozy). The texture was really great, though, and the streusel on top was a superb addition. I used a store-bought graham cracker crust and I would NOT recommend doing that. It got very soggy and awful, kind of absorbed all the liquid. 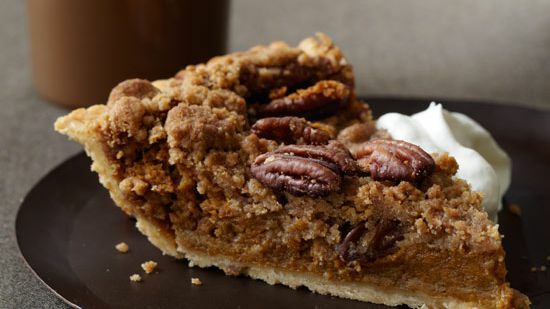 Next time I make this, I'll be sure to make my own flaky pie crust and not be super lazy :) I also thought the amount of pecans was a little low, I'd probably up it to 3/4 to 1 cup of halved pecans. This was about what the picture showed (~2 pecans per slice).